Pleasant and confortable house with a beautiful view to the sea, 250 m to the beach, private swimming pool, garden, bbq grill, 4-car garage, situated in a close condominium, security 24hs per day. 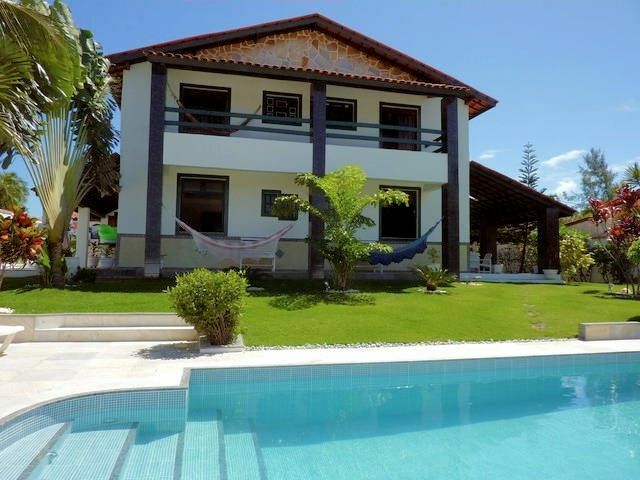 Localizated in one of the most beautifull area of the nord of Salvador between Arembepe (10 km) and praia do Forte (18 km) and 34 km from Salvador International Airport. This house has external larges terrasses with a nice view to the sea. 04 bedromms, mezzanine, TV salon, Dinning and living room, equipped kitchen, 04 toilets. Important: Included in the price: a housekeeper to clean and cook 6x7; a person to clen the swimming pool 7x7; wather, electricity and gaz. Adoramos passar nossas ferias em jacuipe. A casa é realmente maravailhosa, espaciosa, aconchegante, ventilada, e muito bem para o bem estar de todos. Wonderful place to spend your vacation: relaxing, fisching or practice nautical sports, windsurfing, jet ski, boat trips. A real tropical paradise with semi desert beachs place where the sea tortles come to lay its eggs. the ficherman's straw huts where you can take drink a gold beer and think: it is not difficult to be happy. todos os custos com: Agua, luz,gaz, internet, piscineiro, produto de piscina: ja estao inclusos no preço. Disponibilidade de roupa de cama e banho incluido no preço.